Follow the adventures or misadventures of the Warner Brothers, Yakko and Wacko, and the Warner Sister, Dot, in Animaniacs Volume 1. Executive produced by Steven Spielberg, the ensemble cast of off-the-wall Warner Bros. characters, appear in a wide variety of roles as they continuously escape the water tower and run amuck all over the Warner Lot. 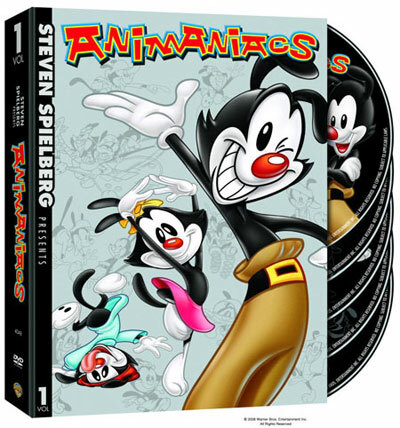 Animaniacs Volume 1 is a 5 disc collectors set filled with over 12 hours of zany adventures along with DVD bonus materials including Animaniacs Live! featuring comic Maurice LaMarche hosting an in studio style interview via satellite big screen TV with Animaniac friends as they comment on the historical show. The witty, slapstick humor with pop culture parodies and cartoon wackiness is a must own for all collectors of classic animation. 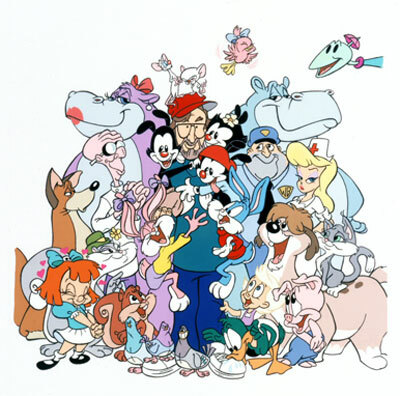 Animaniacs first aired on Fox where it ran successfully for 2 years. The show then appeared on The WB as part of the "Kids WB" afternoon block. * ANIMANIACS LIVE! - Comic Maurice LaMarche hosts an in studio style interview via satellite big screen TV with Animaniac friends as they comment on the historical show.